meghan eats local: Ronald McDonald to Kids: "I'm Still Going to Kill You - But Here, Want Some Apple Slices First?" An apple a day keeps the... no wait, you're still at McDonald's. Today, McDonald's announced a plan that it says will help its customers "make nutrition-minded choices whether visiting McDonald’s or eating elsewhere." The plan includes reducing added sugars, saturated fat, and calories "through varied portion sizes, reformulations and innovations" and reducing sodium by "an average of 15 percent overall across its national menu of food choices." It doesn't get much vaguer than "varied portion sizes, reformulations and innovations." Does that mean there will be a healthy portion option alongside the Super-Duper-Diabetes option? Or that the absurdly sized items will be removed from the menu altogether? And unfortunately, reducing sodium by 15% overall across the menu doesn't mean much. Adding some low-sodium options that nobody who would ever set foot in a McDonald's in the first place would choose to balance out the sodium sand sculptures on the other end of the spectrum won't fix anything. McDonald's USA President Jan Fields said, "The commitments we’re announcing today will guide the future evolution of our menu and marketing." The key word here is "marketing." Beginning in 2012, McDonald's will incorporate "nutrition messages" in all of its national marketing, from TV advertisements to Happy Meal packaging. If a parent sees a commercial with healthy images linked to McDonald's, that parent might think, "Awesome! I'll take my kid to McDonald's for lunch, since now McDonald's is apparently healthy and inexpensive." The Happy Meal the child receives will include the same Hamburger, Cheeseburger, or Chicken McNuggets as before this bogus announcement, the same french fries (although a slightly smaller serving), and (get ready, this is going to knock the socks off your newly healthy feet!) a half serving of apple slices. Woah. A whole half serving of preservative-soaked apple slices packaged in a plastic bag. Because heaven forbid McDonald's actually hand your kid a real apple. This marketing campaign seems not just unhelpful, but dangerous. The fact is, McDonald's food is not good for you. 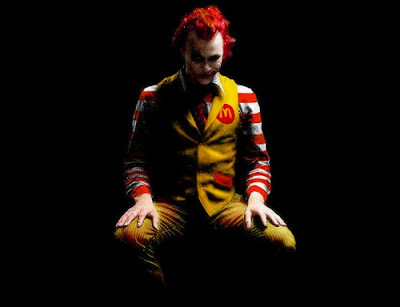 Forget "nutrition-minded choices"; if you're standing in a McDonald's, you have already made a poor nutrition choice. Research cited in the McDonald's press release found that while 88% of its customers are aware of the current option to substitute apple slices for french fries, that choice is made for only 11% of Happy Meal purchases. Obviously, McDonald's customers aren't interested in the apple slices. This new initiative (if it can be called that) makes light of the very real, very dangerous obesity epidemic facing the United States. McDonald's will profit from branding itself as "nutrition-minded" while actually worsening the problem by encouraging more people to eat at McDonald's. The only good component of this plan that I can see is the funding McDonald's now plans to provide to certain community nutrition awareness programs. Just as long as it doesn't come in the form of a Happy Meal toy. you know you don't have to eat at McDonald's. No one is forcing the parents to go there. Mr. W: That's true. But the problem is much deeper than just what McDonald's serves. McDonald's and other fast-food restaurants like it are so much less expensive (and less time consuming) than eating healthy - it's understandable that financially strapped families head there for "meals" so often. So I think McDonald's has a responsibility to be honest about the junk those people are putting in their bodies, rather than staging such a manipulative marketing campaign at the cost of people's health. My bigger issue is WHY their food is so cheap and unhealthy. I think a contributing factor is the government subsidies of corn which make for super cheap feed for cows, which bulks them quick but makes them very fatty, and a super cheap sugar substitute (high fructose corn syrup is in EVERYTHING McDonald's makes) which we all know is very unhealthy when consumed in large amounts. I'd be curious to see if it would impact the obesity problem if those subsidies were eliminated and the money put instead into something like healthy food programs at schools, or nutrition education and subsidies for low-income households. you know part of the problem with childhood obesity is that parents don't make their kids go outside and play around. They sit on the computer, on their phone, or playing xbox. I don't think fast food restaurants have changed all that much, but parenting has. Parents are lazy. As a parent I know McDonald's is cheaper and more convenient, but that doesn't mean I will eat there everyday. I have a problem with anyone trying to tell me how to live my life. Put the calories up, that's fine...it makes the decision easier as to what to get. Obviously parental decisions are some of the most important factors in childhood obesity, but I have a problem when the government subsidizes one industry or sub-industry over another. It has repercussions, in this case unnaturally cheap corn and beef. This alters the market and encourages parents, especially parents with low income, to choose fast food because it is the cheapest option. I don't like the government telling people how to live either, Mr. W. However, I think subsidies, tax breaks, etc., are a way the government nudges people in a certain direction, either intentionally or unintentionally (often with sweeping legislation, effects are unintentional). That's why I dislike government subsidization of agriculture. Meghan, I thought the preservative used to keep the apple slices from turning brown was just a form of vitamin C? I thought it was sold as "Fruit Fresh" and also "Ester-C" vitamin supplement. When I heard this announcement, I imagined they were making apple slices the default choice, making you ASK for fries, which would be a half portion. I can't believe the meal now includes both! Their website says you can ask for double apple and no fries. Well, the caramel dip is gone! I heard Wendy's got rid of mandarin oranges, but at least they leave the peel on their apple slices. You are right about the cost driving choices. I live within walking distance of a McDonald's and Wendy's and they lure me in with free coupons once or twice a month because I am poor and hungry. I like Wendy's salads, but they are $7 alone, and I just now had a Double Cheddar Baconator (doesn't that just sound like the stuff of nightmares), small fry and lemonade for $3 something. I only ate half of the burger and will eat the other half for late night snack/dinner so that was two meals. I would SO much prefer two salads! Super Size Me kept me away for several years. "Just when I thought I was out...they pull me back IN!" Really, I know better. But that was when I had a job. Another thing is that Wendy's placemats suggest the Berry Almond Salad (and Apple Pecan Salad) is only 327 calories without chicken, but when I asked how much the salad is without chicken, she said "we can't do that"! I'll be inquiring about that again next time.